I need to start with an apology, my blog activity was plumeting to new depth since my last post. As you can see the title I try to summarize what happened since February. 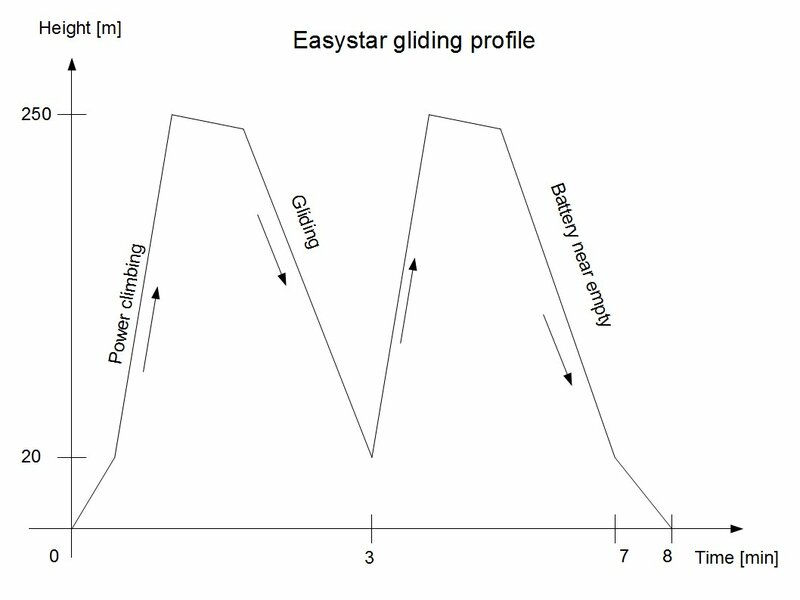 I am getting more and more used to the Easystar and fly it faster and lower. So far I had some hairy moments in combination with wind gusts, but did not crash it yet. I think that I am getting more and more interested in extending my flights to other models as well. Easystar is a great plane to begin with, it can show you many different flight types. It can glide, it can do loops. It can fly rather fast. It is easy to land and it has a forgiving character. Maybe this latter is its biggest weakness after all, as it lacks “the thrill” when you are getting used to it. I will keep my Easystar, since I really like it. A great allrounder plane with high fun factor. But I will purchase some other models soon. Which ones? I will tell in my coming post. Spring is here, the long winter sleep is over. I haven’t been flying for real for the entire winter, only did some simulator practice. So when time was ready to actually fly I was rather nervous. To cure the lack of fingertip feel I launched the simulator to get some reflexes. Please find some hovering exercise with an Ultimate biplane. I observed great interest in this plane, ArcticRC and his mate fly this model in the North of Norway. Great plane, great recording. Nevertheless, I am still flying my modified Multiplex Easystar. I plan to learn flying more before I build a new model. Need to get more confidence in hand starting (although that it might not be needed with planned models), also handling wind gusts and of course flying more stable. I think the more practice I gather with current plane the more I can avoid some stupid mistake with future planes. Although that pilot error is never excluded, how much I might practice. We had some promising weather during the week, so on Thuesday after working hours we drove to the field and started flying. Clouds around us were rather threatening, wind gusts came from nowhere, but overall conditions were okay. I had some problem with one of my mini cameras, so I just have the hat cam and the Hobbyking Wing Camera recording. Anyhow it is more than enough material. I managed to start and land without incidents, however once I did a full roll without willing to do it. I was subject to a stronger wind gust, the plane was tilted almost 90 degrees along longitudinal axis. I wanted to correct, but did not react fast enough and this let the plane do a full roll without me doing really much about it. I think I started to correct but was more amazed by the fact that my Easystar can fly “so advanced” than I was ready to act. Fortunately I was at altitude, so the plane did not lose height that it became dangerous. After this happening I was more alert and could correct wind gusts. I did some low passes, also some gliding. My conclusion is that this 3-blade propeller is not really god. It makes transportation much more difficult. The wings cannot be stucked close to the fuselage as you have a blade every 120 degree. With a conventional 2-blade this is no issue. The efficiency is lower, this results is loss of power. And for some reason even though that I have reasonable pitch on it the motor revs crazy high. So I did not dare to use it on full throttle for long. I ordered APC 6x4E pusher props, will mount one when I get them. That configuration worked much better, but I cracked that prop earlier. Hence the try with 3-blade. Here is my 11th flight, please check it out. I had some flying at last! This winter wasn’t really rich in flying. I haven’t got any plane that can be flown indoors, although I started to practice at least in simulator. I received a car as a present from my mother-in-law, now it is registered in Sweden, so I can drive it. This makes transportation to the flying field much-much easier. Carrying my plane on public transport was always a mess, people stare at you and you have to be extra careful to not break the model on the bus/tramway. Every grab handle or door is hazardous for the integrity of the airplane. I took my Lama v3 to the club, Friday night we met at Mölndal in the sports hall of a school. The others had various slowflyers and multicopters even. My flying skills got rather rusty (or dusty? ), so I took caution. Practiced some rounds and 8 figures. Had to be careful to not fly too high, since the others were flying airplanes there. Was fun after all. I wanted to spice up my recording, so had my hat cam and a mini camera on Lama even. The mini camera influenced flight characteristics of Lama, it became nose-heavy. So I had to fight with cyclic to maintain constant speed. If I sped up Lama lost control and dived into the floor. Lama cannot fly fast at all. I have seen a clip on Youtube that explains how much difference it makes to have the music of Inception in a clip. I had my 10th flight with Easystar, a nice number it is. This time we flew in really strong wind. I flew in constant steady wind at the sea, that is not easy but you can manage after that you get familiar with wind direction and strength. But same theory did not apply on Sunday. There was a steady wind of 6 m/s most of the time. But every now and then the wind just died to almost calm state, then we got some really strong gusts of up to 13 m/s speed. That was the challenge. Upon start and landing I had major difficulties, I am not at all comfortable with such strong wind. I did not crash the plane, but I had to fight for it several times. Prior to flying I changed propeller. I had a 6x4e pusher on, some cheap propeller from Hobbycity. It was not really well balanced from start and then I cracked it when one of my early start attempt ended up in a very low pass over the vegetation. It was so low that I actually flew straight across some tougher grass and the prop acted as a chopper for some brief time. This cracked the last half centimeter on one blade, so it wasn’t really healthy. I thought that I will be smart enough to try a 6x3e pusher prop. How hard can it be? It did not really work out. For some reason thrust is very low. It pushed the air backwards but just. Maybe I put it up in wrong direction, I have to check this more. Anyhow, right now I have maybe 2/3 of thrust at maximum. Maybe less. Starting the plane and flying it in that much wind was a major challenge. At some point I thought that wind is pushing it more backwards than I can get forwards. Since it was very turbulent I had difficulties flying straight, it was all over the place. Landings were extra tricky. When descending a sudden gust can take away altitude at alarming rates. A quick descent of 3-4 meters is likely. At low height this can mean plane in the lake for instance. So I was very careful above the lake. But no matter how careful you are, some unexpected event can happen easily with such wind speeds. Once I landed already, Easystar was skidding on the grass and slowing down. Suddenly a stronger wind gust liftet up the plane from the ground, since it was strong enough to temporarly simulate much higher speed of air flow around the wings. So even though that the plane was already landed it just took off. I managed to try out my brand new 35 USD camera, that went without issues. Works like a bliss. In my video you can see the difference. I have a standard definition keyfob camera on the nose of the plane. It has a 180-degrees fisheye converter lens mounted. The Wing Camera from Hobbycity is a stock item, it comes with a nice wide-angle lens from the store as stock. So ready to use. If I count the price of SD keyfob + the fisheye converter I am already above the price of the HD Wing Camera, so choosing the former is just silly. The latter is much better value. You may see a comparison chart in my post from the other day. The footage I got with the new camera is simply amazing for me, now I can see much more detail. If I manage to fly this kit on a calm day the turbulence will not influence so much, so I can get really nice footage. Looking forward for some nice sunny and calm autumn day. – ATI X800GTO2 graphical card (a variant of X800XL) with 256 megs or VRAM. This was quite okay up to the time when HD appeared. On SD resolution it handles all tasks except gaming. But I don’t do gaming anymore. With HD it becomes a different story. HD videos don’t play on my computer without judder. Even 720p (1280×720) resolution drops frames while the computer struggles on 100% power. 1080p (or 1920×1080) is not even worth trying. It is just some frames every 10 seconds maybe. Hopeless. It is important to make some difference between playing an HD footage or processing it. Playing can be helped by some more modern graphical card that can take over computing. So even a low-end computer can handle playing it. But processing in a video processing utility is a different story. For that you need high power from the CPU, a lot of RAM and good data transfer on the motherboard. In short you need a modern computer. I made the editing anyhow and had a lot of waiting. When trying to align two video tracks for a picture-in-picture layout I am checking on the preview pane if the two frames are in roughly aligned. It is no professional work, if it plays within a half second I consider it already a pass. On SD footage this operation was already difficult, since my computer is low on performace. There were a lot of dropped frames, you had to sort of “lead” the cursor, move it and wait for the result before you let lose of the mouse button. With HD this is much worse. It takes several seconds for the preview pane to update. A simple play operation is meaningless, it takes seconds without picture update, then you pop up somewhere else on the timeline. Totally useless. The only way to work with it is to move the cursos very slowly and then wait for the result. I fought with it for 2 hours to get 4 pieces of picture-in-picture shots aligned. Very time consuming. Rendering itself was surprisingly fast, despite HD clips the 8 minutes footage rendered in roughly 1 hour. Not so bad. I render still 640×480 resolution, maybe should try 720p rendering next time. I don’t know if there is so much to win about it in my case. What I would need is much more computing power. I read a lot of reviews and came to the conclusion that it is time to buy something that will last for some years in the future. Maybe not 6 years, we shall see how long I manage this time. I set my eyes on the Core i7 architecture from Intel. It has 4 cores and all 4 can simulate 2, so alltogether you get 8 virtual cores. Despite being “only” quadcore it beats the respective offering from AMD by a good margin in video processing. In some test under Sony Vegas 9 it was almost 2x faster in rendering (compared to a 6 core Phenom II processor). So that is the aim, to have a really powerful CPU. I will target a lot of RAM even. Minimum is 4 gigabytes, but can extend later depending on needs. Considering the graphical card I don’t really have high demands. My favourit RC simulator shall run without glitch, that is the specification. I made some studies regarding this issue, checked homepage of the simulator and checked their recommendations. Also checked some Nightflyyer reviews about specs. We shall see how I manage. When I will get the new system running and I tested it I will try to get some comparison. I tried out my 3-blade propeller. It is a Master Airscrew, 6×4 pusher. MA0640TP is the type of it. I am proud to announce that I had my first proper crash. It comes sooner or later, you cannot avoid it. Mine came today. 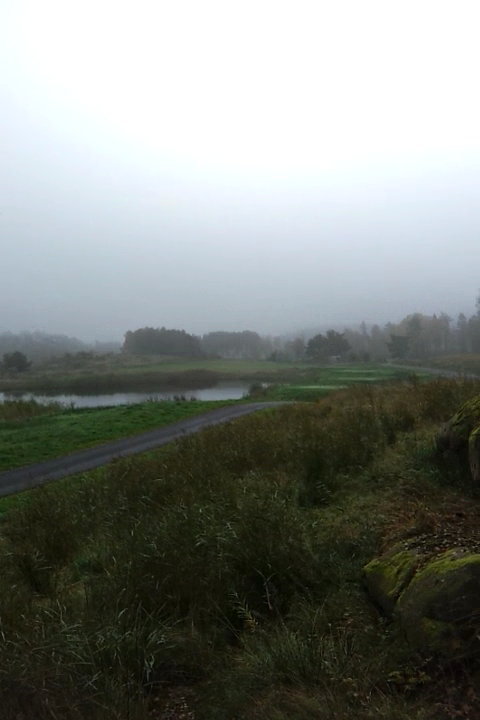 We went out flying with HaBoRC, even though that the city was covered by fog. We thought that it might clear up during the day so we took our chance. When we arrived to the field conditions were far from perfect. I could hardly see the forest close to the field. I took a sweep recording, that shows a more cleared up view actually, in the beginning it was much worse. Our initial activity involved recovering a plane that was crashed onto a tree some 7 meters high from ground level. We constructed a set of poles (taped together with Duck Tape, a special version of the famous Duct Tape actually 🙂 ). One member of our team was brave enough to climb up on the container containing gardening tools and nudged the plane down carefully. It was as slippery as ice, the fog made everything wet. HaBoRC started to fly with his flying wing, I took off shortly after him. We agreed to fly close to the field so that we don’t lose sight of the planes. So did we. I started to turn tight so that the plane would stay in sight. I managed to make contact (collide) with the flying wing. I lost orientation of the plane (was extremely high adrenaline all of a sudden), to stabilize it I leveled it out. I was close to the lake, wanted to avoid it. Leveling out was good, but this enabled the plane to fly out of my sight, it went into the fog. I was desperate, tried to turn back blind but realised that with power on in the fog I will just smash it, so I chopped throttle and hoped for the plane gliding smoothly onto the fields. What I managed I was unsure of. The very last moment I could turn away from the lake, that was good. But did it manage? Or is it in thousand pieces? I walked along the small road and then discovered the plane. It was stuck into the soft vegetation covering the rocks. Pointing downwards, but the wings were on, control surfaces were on. Even the shape was normal. 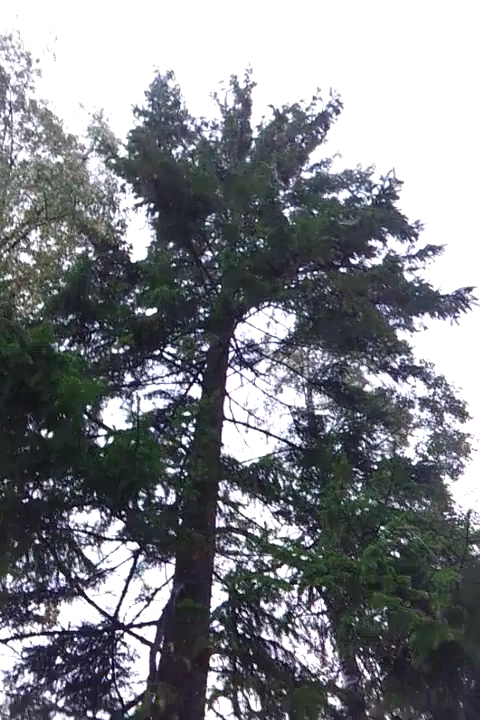 As I got closer I could see that it was gliding against a huge pine tree and ricochet to the soft bush. I could move the ailerons, elevator and rudder. Even the prop could spin up. The only thing missing was the canopy. I tried to find it but the fog was so thick that I couldn’t. I thought that it might popped off when I collided with the flying wing. So I started to wonder around in the deep wet vegetation behind the field. My boots got totally wet, socks wet, then the trousers got wet even. Nothing. I thought that I might find it when the sun comes around. 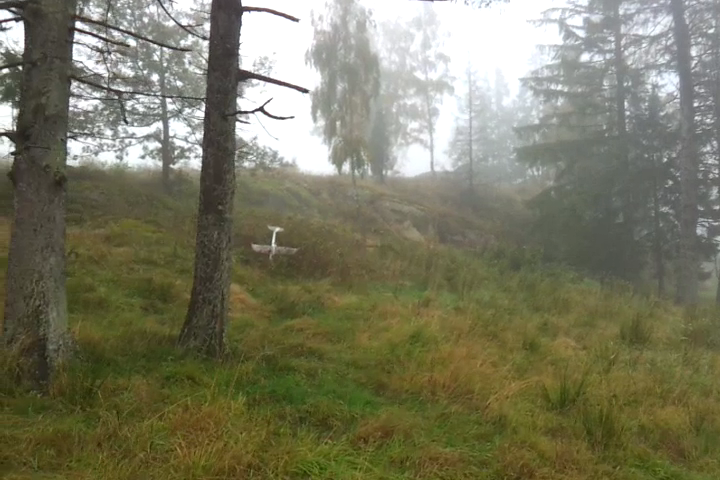 Recorded the others flying then I got back to the pine tree when the fog cleared up. And there it was my canopy. Close to the other big pine tree. 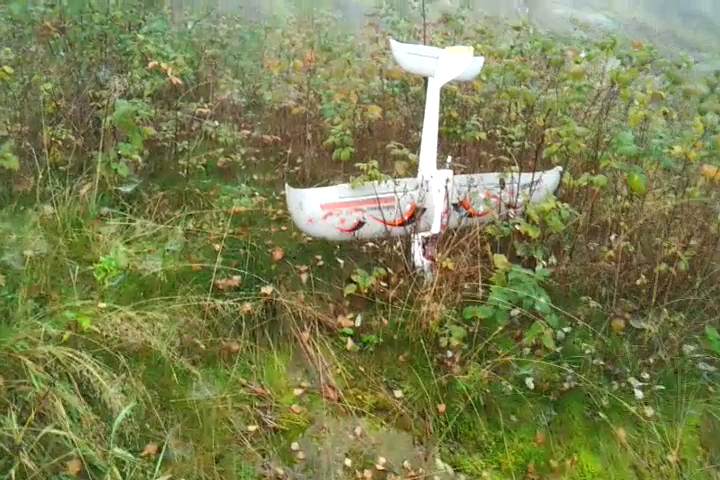 That might took the first contact, the canopy popped off and then the plane crashed into the bushes. The plane glided so far in the fog. 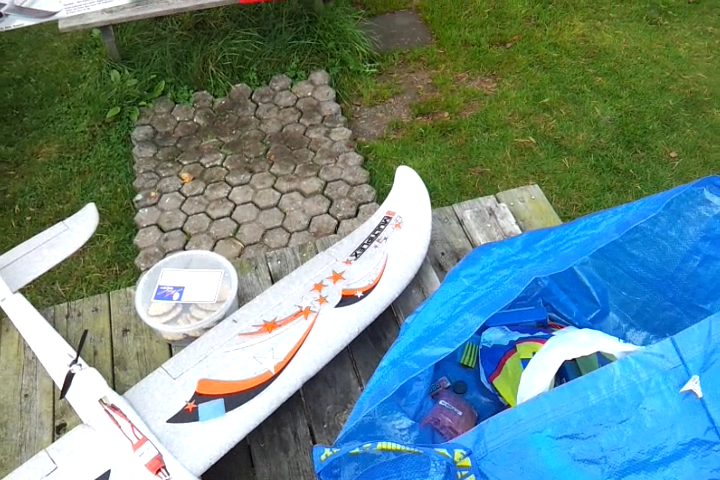 When I got back HaBoRC recovered his flying wing as well. I just tried to help him, wondered around the motorcross track and when I was back he had his plane as well. Great relief, I felt really badly after colliding in the air. After a while I started flying again and could record some nice low passes. I still haven’t got my 2nd mini camera working, the replacement battery haven’t arrived yet. Please see the recording of my flight here. 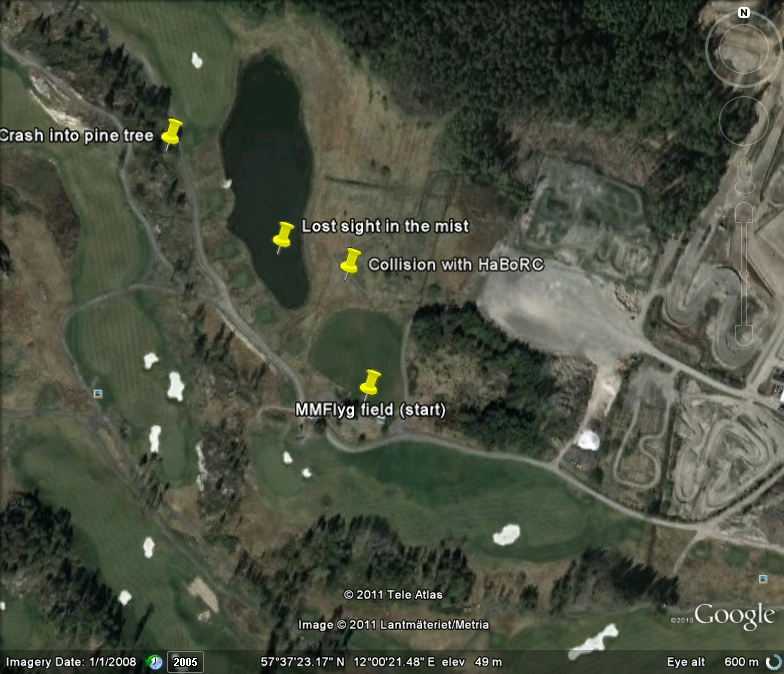 Hopefully soon I will get my Hobbyking Wing Camera and can get you much better looking recording. We summoned with some club members at Balltorp field and got our dose of flying. Great times! My little side project was about to get more interesting recordings from the sky. I had 2 new mounting points on the plane, on the fuselage, under the main wings. The idea was to mount the mini camera pointing downwards and recording “satellite” images. I thought that if I can get very high up and get a good wide-angle view it will look nice. Well, it did not go so well as I hoped for. One of my cameras died prior to flying. I charged them up from the USB port and went to flying. Unfortunately these 15 dollar cameras don’t really come with any user interface. There is 2 amber coloured lights on it. By shining or blinking them the camera tells you what mode it is in. Or by not responding to the buttons it tells you that it either crashed or just drained its battery. Or in my case just died off. As far as I understand the charging and battery management in these cameras are not so sofisticated (you can guess from the price), this results in battery overload. I dismantled my camera to examine it. The battery is a 1-cell Li-Po with some 160 mAh capacity approximately. In ideal case it provides juice for 45 minutes. However when you charge them on USB-port you do charging with 500 mA current. That might be too much. 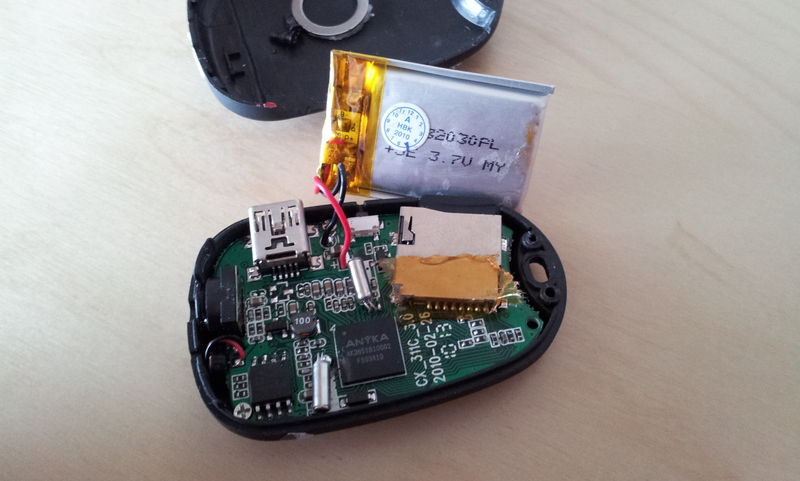 Or the battery management circuitry does not protect it from overcharging well enough. Anyhow my camera reached its end of life. At least the battery did. It is a 240 mAh 1-cell LiPo with a standard JST connector. I just ordered such connectors, so I could solder a connector onto the camera, lead it outside of the plastic housing and attach this “proper” battery on top of the camera. So I could charge it from the iCharger charger with proper current and without overloading it. I could check its drain level with my LiPo Cell Checker and I could have the camera for longer time. Why dispose something when you can mend it? We shall see how well I manage with this. First I will check if the camera is able to take pictures from the USB port. If it does not work then it is maybe not much idea to attach the external battery since the camera itself is broken even. I need to investigate further. Back to the flight. The weather was reasonably good. Some clouds, some wind. Later the wind picked up speed but it was manageable. I did some good hand starts (I am still learning to throw with left hand). Then I had some really bad start attempt. There are some insects that love to fly around the eyes. One got into my eye precisely when I launched the model. I have got totally distracted and launched the plane into the ground. Very embarrassing. I became nervous and did it again, now without the insects, just me being clumsy. This did not really help. So a club member launched the model for me, then I calmed down and could continue flying. Pretty ashamed I was, dropping the model twice is just silly. I did some high altitude recordings and then I noticed that the other camera (the one still working) was drained as well. I assume that the internal battery is giving in there also. So I might need to upgrade it. I noticed that even though that I bought these cameras from Hobbycity I have two different batches. One renders pretty nice green colours and handles light changes quite well. The other (the one still working) is worse. It renders more like cyan and blue colours and is pretty bad in high contrast situations. Like sky/ground scenario. Which is little unfortunate when you try to use it as an airborne recording device. So I am very much looking at this. It is a much better camera from Hobbycity. It has 720p HD resolution. Not FullHD, but 1280×720 at 30 fps is far better than the one I have right now (being 640×480 with crappy plastic lens and much noise). A pretty good comparison of what you get is possible to see on following Youtube video. Author is ultralajt, he made a video comparison of both cameras on same plane. Basically you get much better dynamic range, much longer battery life and much nicer wide-angle view. For roughly twice the money, this one costs 35 USD without memory card of course. I flew out all my 6 batteries but the day was far from being over. I recorded some Tricopter action. HaBoRC built one and flew it first by eyesight, then by FPV. We helped him by telling altitude, so in initial takeoff phase he did not get disorientated. Quite fun it was. The footage looks great. Another colleague came with a Quadcopter. That is a funny beast as well. There was a Yak55 even. HaBoRC showed some acrobatics with this light plane in turbulent conditions. The cherry on top of the cream was when he catched it while hovering. Another club member recorded footage of this. All in all it was a great day. Here is my recording. My 7th flight has happened. As one of my favourite bands say: “7th son of a 7th son”. Look it up, great song. I made a sketch of my flight profile for better illustration. I call it a Hi-Lo/Hi-Lo profile, I lended this expression from military terms. There you can have different techniques for ingressing and exgressing from the hot zone, depending on the altitude profile these are called similarly. Anyhow this is a peacful mission, so no weapons are on board of my humble Easystar. What I do you can see on the graph. Horizontal axis is time, vertical is height. I take off, do maybe a quick round and then climb against the wind as steep as possible. This phase is on full power, the plane climbs at maybe 60 degrees against the wind. I gain height and climb as far as I can see the plane against the sky or clouds. This is approximately 250-300 meters. I estimate it based on the sound delay when I chop throttle at the end of the climb. Sound travels at 340 m/s roughly, so 1 second delay would be approximately 340 meter distance. As I can only estimate the angle I am above horizon (the azimuth) height would also be a guess only. But something like 250-300 meters. Quite high actually, you can see very far away on a clear day from that height. When I am up there I close the throttle and start gliding. I do some circles as well to record as much of the sight as possible. Then I glide along the field with the wind, do a turn and glide against the wind. And repeat this as long as I have altitude left. To lose altitude quicker I can do some loops or half rolls. Quite fun. Since I have stiffened up the wings doing a loop will not bend them so much as without stiffening. When I am close to the ground I do a school turn (an oval above the field) and then turn into the wind and climb again on full throttle. This enables me another climb to altitude. Then I glide down and land. These 2 climbs and glide sessions fit into the 7 minute window that is advised, I drain the battery to something like 3.8-3.9V per cell. This is a comfortable storage voltage. Then I can change battery and take off for a new round. I managed to fly 5 batteries then it started to rain. The last flight was almost in the rain, I bled altitude with multiple loops to not get the plane soaked. Could record some other flights meanwhile, a Sukhoi-29 and a QuadCopter among others. The Sukhoi was a big aeroplane, built from balsa with film cover and a massive 6-cell setup. The battery is like a half brick, the electric motor is of size of a tomato. Impressive. Even more impressive is the noise of air whistling around the plane as it travels. Very nice exprerience. I had one small incident, managed to do a faulty start in the beginning. I did not have the hand on the yoke, just launched the plane and then it fell on the grass. Stupid mistake. It did not crack, but anyhow rather embarrassing. The next start I had the hand on the yoke, so I could recover from the dive and do a proper takeoff.